Wine Kitz™ is all about helping you craft wonderful wines, and making the process easy, fun and affordable. Part of a nationwide franchise that goes back to 1959, Wine Kitz Moncton is locally owned and operated by Kolin Murphy, and is the first and only location in Moncton, joining many other Wine Kitz locations already thriving in the province of New Brunswick. 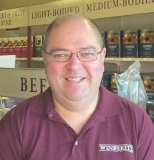 An avid wine lover, Kolin has been serving the public for 34 years in a variety of fields, from restaurants and bar/lounge to retail and manufacturing. Kolin has now put his skill set and passion for wine to use in taking the reins of the Moncton Wine Kitz, and looks forward to serving you and helping you make delicious wines! We stand behind our products 100%. We are certain you’ll enjoy the wines you make with us, and we offer a complete satisfaction GUARANTEE. Since its inception in 1959, Wine Kitz (originally known as Wine Art) has been the leader in the consumer wine making industry and today is one of the world’s largest and most respected winemaking retailers. Since Wine Kitz manufactures its own wine kits, we can confidently stand behind the quality of our wines and say you’ll love the wines you make with us. We ensure every aspect of the wine kit production process will result in high quality wines for your enjoyment. We source grapes from top vineyards and wineries around the world. Then, combining traditional procedures and technical modernization with the evolution of tastes, these grapes are made into quality concentrates. At our state-of-the-art facility, through innovative product development, we develop wine kits that surpass our exacting standards and make wines that have characteristics and taste profiles equivalent to comparable commercial wines. We’re wine lovers too, and we know the experience of wine is an important part of life’s celebrations. Like food, there are wines for every event in your life. Wine Kitz has wines for every occasion from the casual to the momentous. You’ll find our wine consultants friendly and helpful, making sure the wine you make complements the occasion you’re celebrating. Choose from hundreds of varieties including such classics as Chardonnay, full-bodied Cabernet Sauvignon, crisp Rieslings and rich Merlots. Whether you enjoy a glass of wine occasionally or have a wine cellar your friends would envy, we can help you enjoy your favourite wines, all for a fraction of the cost of wines purchased at your local liquor store. We have a wine to suit your every mood, from every day table wines to exclusive limited releases. Enjoy!